Welcome to Anytown, U.S.A., where people grumble about the quality of their health care but still show up at Healthy Heart Hospital hoping they made a smart decision. Much has been said (and even more has been written) about the previous administration’s haphazard management of Healthy Heart. In an effort to save the Hospital, you and your allies among its leading Physicians have staged a recent “Clinical Coup” and taken over the Hospital to restore its prestige. Does your team have what it takes to bring Healthy Heart Hospital back to its former glory without becoming Hard Hearted in the process? 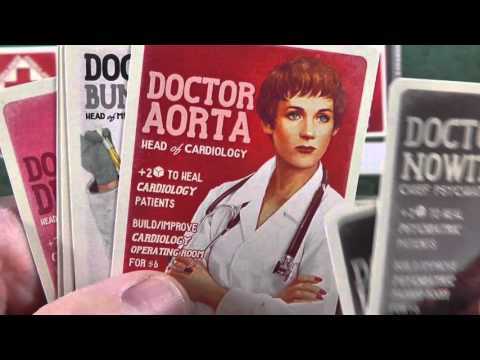 Healthy Heart Hospital, from designers Scott and Anna Nelson, is a cooperative game for 1 to 5 players, played in rounds, with each player spending actions to treat and (hopefully) cure the various patients that come pouring into the hospital each round. Patients are represented by cubes of various colors. Color represents the type of illness, while the number of cubes represents the severity of the illness.